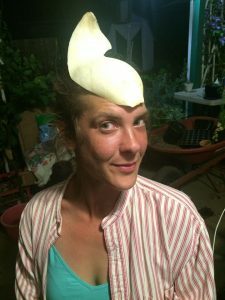 For a garden blog I thought a photo of me wearing a Magnolia macrophylla flower petal as a hat would be ideal. They make great hats! Try it! My name is Susan Langenes, and it sounds like “Languages” — LANG-eh-ness. I’m a Portland native who spent about half my childhood on a small farm just outside of Banks, Oregon, where my family and I gardened like mad, raised sheep, and wandered around in the woods for hours looking at plants. Okay that last part was mostly just me. Ever since I can remember I’ve been fascinated with plants, a lover of animals, and into visual arts. My formal education is in both visual arts and music. All of my adult life I’ve only been able to garden minimally because apartments, or moving too often; I didn’t get a real garden space of my own until September of 2014 when I moved to Milwaukie, Oregon, and found myself with a real yard. The first year, I established vegetable beds. The second year, I continued with more beds and introduced poultry, and started the process of lawn grass elimination. This blog begins in the third year (2017) in which I start to really work on the not-vegetable parts of the garden. My fetishes, in no particular order, are Australian plants, blue/silver plants, and native Cascadian plants. I also work with a couple of good friends at their gardens nearby, so their plants and gardens are occasionally featured here too. All photos are my own (taken with an iPhone camera, generally), unless otherwise noted. If you want to use any of them, go right ahead. You can contact me anytime via email: susanlangenes@gmail.com.